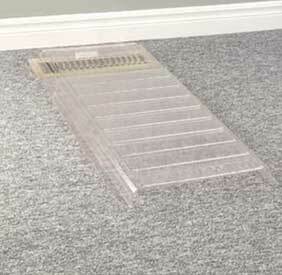 Extend a Vent- Deflector air under furniture. It safely re-directs warm and cool air from furniture, drapes and plants, while increasing heating and cooling efficiencies. Extends to 36" long. Unbreakable clear plastic. 9 3/4" Wide. Fits over most floor registers.